WWW, April 2014 - He won a Grammy award multiple times, and that's just for his musical works. His teaching and writing skills have not gone unnoticed either. Talking about Joe Ferry, dr. Joe Ferry: widely acclaimed bass player and record producer as well as talented writer. But this is about the music. Music with King Tubby and Augustus Pablo to be precise. 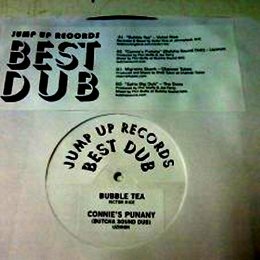 We're talking about "Perfida DUB", unmistakably a Jamaican Roots Rockers tune from the seventies. A Dub carrying King Tubby's mixing skills as well as musicians playing in ways that super stars can only dream of. 555 Crown Street carrying the works of Augustus Pablo is a true classic, needs no introduction or description other than the remark it is present on this album. Which says a thing about Joe Ferry! Of course, these two tracks are appetizers. Appetizers for what is coming. And what is coming is more fat DUB and Reggae in the Roots tradition. Solid riddims, excellent works by the musicians and the engineer, matching perfectly with the classic historic recordings on "Connected". You'll even hear resemblances of Black Uhuru recordings in the guitar play ("Unwind" by Menace). It's not only Dub even though the album is truly all about the Dub. There's a vocal track by Uzimon and The Dons called "Don't Go Bang", a thing which makes you realize something about the title of the album. Makes you want to listen to the Dub of the track as well... There's Victor Rice again (reviewed at mp3.dubroom.org), bringing you "Bango" which is kind of a hybrid between Dub and a vocal track. There's the Big Ska Band with a Dub that could be taken off a secret Dub album by the Skatalites. 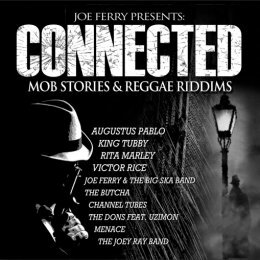 If Joe Ferry's "Connected: Mob Stories and Reggae Riddims" resembles anything of the book that this release accompanies, you might want to check that out as well. The album surely brings that upfull yet intense vibe only Reggae Dub can bring especially when it is played in, as said, the Roots Tradition. WWW, April 2014 - Bass player and producer Joe Ferry has been in the business of Reggae music for many decades. He's been there, done it. Four tracks on a limited 12" released in 2014 to give you a taste of the crucial stuff he is/was involved in! The 12" opens up with an old skool Dub by yet another expert in the discipline: Victor Rice. Second tune has a title we will not repeat here, but needless to say that here we have another analogue Dub in true old skool style. The B-side carries another two tunes, with some fatter bass and more intense mixing. The Channel Tubes playing a solid Roots riddim with skillful effects on the bass and organ play Jackie Mittoo style. The Dons closing off with "Satta Big Dub": four minutes of Old Skool mixing in ambient style if you know what I mean. A true collector's item, get one while you still can!